AEGEE stands for Association des États Généraux des Étudiants de l’Europe and it is the largest trans-national, interdisciplinary student organisation in Europe. You can find here the Wikipedia article about it and here the organisation’s website. I was a member of the association from 2000 to 2005, while I was studying at the university. So were my brother and sister, and many friends. A couple of days ago, on the occasion of the 30th anniversary since the creation of the organisation, one of these friends, Juan, shared a reflection along the lines: of the many things that I have stumbled upon in my life, the one which changed it the most was AEGEE. He talked about learning, volunteering in associations, taking part in youth councils, meeting friends, organizing events, learning or practising languages, and experiencing what Europe is, beyond stereotypes. I subscribe his reflection word by word. I have written over 500 posts in this blog and I now realize that I hadn’t yet dedicated a single one just to AEGEE. This is it. I joined AEGEE in the spring of 2000, after having read an article in a university newspaper talking about the Summer Universities. I applied for one of those summer events in Istanbul. There I spent 2 weeks with about 30 other students from Slovenia, Croatia, Yugoslavia, Poland, The Netherlands, Austria, Macedonia, Azerbaijan, Turkey, Spain… that experience was life changing, as you read it. In the following 5 years I took part in another couple of such summer universities in Croatia and Macedonia. I helped to organize several others in Madrid and The Netherlands (and I casually visited some more). I took part and organized several student’s exchanges under the European Commission’s Youth Programme. I took part in the large event Youth 2002 in Denmark. I travelled Europe from one corner to another. I met friends from the several countries with which today, 10 to 15 years later I am still in contact with, many of which I have visited along these years. I made a couple of round-Europe inter-rail trips. I crossed borders on foot, car, bus, train, boat and planes (we even unknowingly crossed some former minefield in the border Macedonia-Kosovo). I learned that not all countries have as dialling out code the 00. I slept in trains, hunter’s cottages, train stations, airport toilets, planes, buses, gyms, students’ dorms, boats, friends’ homes, and even some youth hostels and hotels (and, of course, the house of AEGEE’s Comité Directeur in Brussels). I met Luca in late 2002, who I married in 2013. Surely, I got my parents’ suspicious of the association and they seeing it as a source of distraction from university studies (it was). But as my friend Juan mentioned: it’s not much of an exaggeration if we say AEGEE might be the thing that has changed my life the most. By the time the Erasmus Programme was adopted in June 1987, the European Commission had been supporting pilot student exchanges for 6 years. It proposed the original Erasmus Programme in early 1986, but reaction from the then Member States varied: those with substantial exchange programmes of their own (essentially France, Germany and the United Kingdom) were broadly hostile; the remaining countries were broadly in favour. Exchanges between the Member States and the European Commission deteriorated, and the latter withdrew the proposal in early 1987 to protest against the inadequacy of the triennial budget proposed by some Member States. However, AEGEE, the Association des États Généraux des Étudiants de l’Europe, persuaded French President François Mitterrand to support funding for the Erasmus programme. In the next few months a compromise was worked out with a majority of Member States, and the Programme was adopted by simple majority in June 1987. In 2005 I also took an Erasmus grant to complete my final career project at the Rheinisch-Westfälische Technische Hochschule Aachen (RWTH Aachen). AEGEE was born in 1985 out of the EGEE 1 conference (États Généraux des Étudiants de l’Europe) held in Paris in April 1985. In 2003 while travelling to The Netherlands with a Youth programme students’ exchange, my brother, some friends and I made a stop in Brussels. My friend and then AEGEE-Madrid president, Javier, and I wandered through the files of AEGEE-Europe office and made some copies of old press’ articles. Among them the one you can see below of that EGEE 1 conference in which the problem of students’ exchanges was discussed. 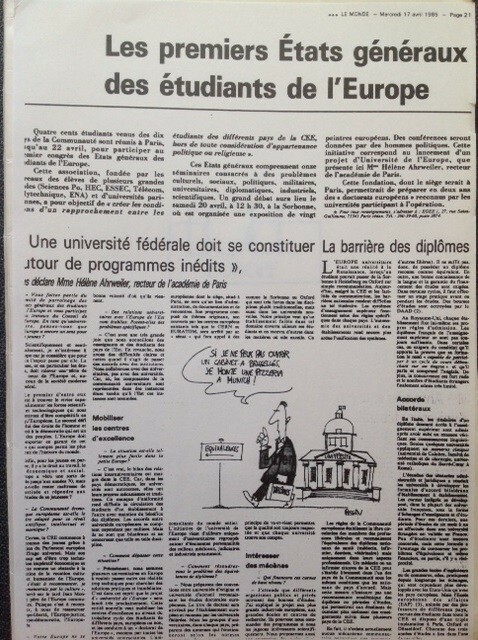 Coverage of EGEE 1 conference by Le Monde (April 17, 1985). May this post serve as a first homage to AEGEE and to all the members who sustained it through these first 30 years. And if you are a university student, the chances are that in your town there is an AEGEE antenna; check it out and join it, you won’t regret it!